Early Medical termination using an oral dose of the anti-progesterone, mifepristone, followed by an appropriate (vaginal or oral) dose of misoprostol. Medical termination using an oral dose as appropriate of the anti-progesterone, mifepristone, followed by multiple doses (vaginal or oral) of misoprostol. 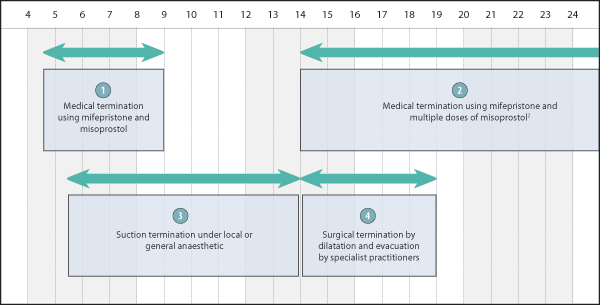 Surgical termination using electric or manual suction, under local or, if appropriate, general anaesthetic. The uterus is emptied using a suction curette. Sharp curettage with metal instruments may be necessary. Surgical termination at later gestations usually performed after preparation and dilatation of the cervix with Laminaria followed some hours later with a combination of suction curettage and specialist forceps, performed under local or general anaesthetic as appropriate.